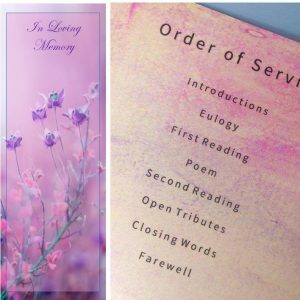 A service sheet or bookmark is helpful during the funeral service but is also a special keepsake not only for family but for attendees, friends and acquaintances who attend the funeral service. At Riverview Funerals we have vast experience in formatting and designing both customised service sheets and bookmarks. We design new service sheet and bookmark templates very regularly but we also make templates available for anyone who would like to design their own for a loved one.